USA: The US Social Security Board decides to issue nine-digit identification numbers to Americans, which will later be known as Social Security numbers, and establishes 89 district offices and 469 branch offices. Germany: Esterwegen Concentration Camp in Germany is closed to be converted into a punishment camp. The prisoners are ordered to build the Sachsenhausen Concentration Camp. Spain: Day 324 of 985 of the Spanish Civil War. Spain: Day 689 of 985 of the Spanish Civil War. CBI - China: Day 334 of 2,987 of the 2nd Sino-Japanese War. Day 119 of 124 of the Battle of Henan. CBI - China: Day 699 of 2,987 of the 2nd Sino-Japanese War. CBI - Mongolia: Day 26 of 129 of the Battle of Khalkhin Gol, a border dispute between the Soviet Union and Japan. Atlantic: The German sub U-48 sinks the British armed merchant ship STANCOR 80 miles northwest of Scotland. ETO - UK: UK Home Defense commander Ironside announces the creation of the "Ironsides," small groups of highly mobile, armed men for defense against paratroopers. ETO - Norway: Day 58 of 63 of the Battle of Norway. 4,900 Allied troops begin boarding transport ships at Narvik for evacuation. ETO - France: Day 27 of 44 of the Battle of France. The Germans begin Operation RED, attacking the French left wing anchored along the Somme for 120 miles in fortified positions known as the Weygand Line, 100 miles from Paris. ETO - France: Hauptmann Mölders, Germany's top air ace (25 kills) is shot down near Compiegne and taken prisoner. He will be released later upon the French armistice. CBI - China: Day 1,065 of 2,987 of the 2nd Sino-Japanese War. Day 204 of 381 of the Battle of South Guangxi. Day 36 of 49 of the Battle of Yichang. USA: The US House Appropriations committee introduces the largest Army expenditure bill since the First World War at $10,000 million. Atlantic: German sub U-48 sinks the British ship WELLFIELD 670 miles north of the Azores. Atlantic: The HMS LONDON and HMS BRILLIANT attack the German tanker EGERLAND 700 miles southwest of Cape Verde islands. The crew of the EGERLAND scuttles their ship. ETO - UK: Before dawn, German bombers attack Birmingham, but most of the bombs miss their targets and fall outside the city. Finland: Finland begins mobilizing their military. Germany: Over 100 German divisions have now been deployed along Germany's frontier with the Soviet Union. MTO - Greece: Germany announces that 15,000 British and Commonwealth soldiers were captured at Crete. Later the British will say that only 12,970 were unaccounted for. MTO - Libya: Day 57 of 256 of the Siege of Tobruk. British sub HMS TRIUMPH sinks the Italian gunboat VALOROSO and two small transports, the FRIEDA and TRIO FRASSINETTI, off the coast of Libya. East Africa: Day 361 of 537 of Italy's East African campaign in the lands south of Egypt. CBI - China: Day 1,430 of 2,987 of the 2nd Sino-Japanese War. Japanese aircraft fly more than 20 sorties against Chongqing over a 3-hour period, dropping bombs on civilian sections of the city. In just one of the air raid shelter tunnels, 4,000 Chinese die from asphyxiation. USA: The United States declares war on Bulgaria, Hungary and Romania, who had declared war on the US in Dec 41. FDR says, "I realize that the three governments took this action (to collaborate with Nazi Germany) not upon their own initiative or in response to the wishes of their own people, but as instruments of Hitler." USA: President Roosevelt threatens the use of poison gas against Japan if Japanese troops deploy any poison gas in China. Atlantic: Day 143 of 169 of Germany's Second "Happy Time," during which U-boats sink 609 Allied ships with little risk. Germany: The Nazi SS organization reports that 97,000 people have been "processed" (killed) in mobile gas vans. Russian Front - North: Day 271 of 872 of the Siege of Leningrad. Russian Front - North: Day 32 of 658 of the Siege of the Kholm Pocket. Russian Front - Center: Day 8 of 31 of Operation KREMLIN, a German diversion to trick the Soviets into thinking Moscow is their main objective instead of Stalingrad and the Caucasus. Russian Front - South: Day 219 of 248 of the Siege of Sevastopol, Crimean Peninsula. Russian Front - South: Operation BIRDSONG begins between Roslavl and Bryansk, as 5,000 German troops pursue 2,500 partisans. About four-fifths of these partisans will be killed. MTO - Libya: Day 11 of 27 of the Battle of Gazala. British troops mount a large counter-offensive south of Tobruk, but are held off. East Africa: Day 32 of 186 of the Battle of Madagascar. CBI - China: Day 1,795 of 2,987 of the 2nd Sino-Japanese War. Day 22 of 124 of Japan's Zhejiang-Jiangxi Campaign, launched to punish anyone suspected of aiding the Doolittle raiders in China. Roughly 250,000 Chinese will be killed. PTO - Alaska: Aircraft from the Japanese carriers RYUJO and JUNYO attack Dutch Harbor, as Japanese troops occupy Attu. PTO - Australia: Day 6 of 9 of the Battle at Sydney Harbor. PTO - Malaya: Day 107 of 357 of the Battle of Timor Island. PTO - Midway: Day 2 of 4 of the Battle of Midway. The Japanese Fleet begins retreating homeward, but the battle continues as both sides keep searching for each other. US 7th Air Force B-17s and B-26s continue flying patrols, attacking any Japanese warships found. PTO - New Guinea: US 5th Air Force B-17s hit wharves, a warehouse and a coal jetty at Rabaul. USA: Day 6 of 9 of the Los Angeles Zoot Suit Riots. The violence escalates with thousands of servicemen joining the attacks, marching abreast down streets, entering bars and movie houses and assaulting any young zoot suit wearing Latino males they encounter. Local police accompany the rioting servicemen, but have orders not to arrest any military personnel. Many Latinos are arrested on charges ranging from "rioting" to "vagrancy." Atlantic: German sub U-513 sinks four ships off the coast of Brazil. Russian Front - North: Day 636 of 872 of the Siege of Leningrad. Russian Front - North: Day 397 of 658 of the Siege of the Kholm Pocket. MTO - Italy: Day 15 of 20 of the naval and aerial bombardment of Pantelleria Island. MTO - Italy: US 9th Air Force RAF heavy bombers attack the harbor at Catania, Sicily. MTO - Italy: US 12th Air Force RAF Wellingtons night bomb the docks and town area of Pantelleria Island. During the day, US planes attack the island again as well as the harbor and shipping at La Spezia, Italy, and targets in Sardinia. CBI - China: Day 2,160 of 2,987 of the 2nd Sino-Japanese War. US 14th Air Force attacks troop columns near Peiyang and hit a barge and boat northwest of Yoyang. PTO: Day 10 of 47 adrift in a raft for the survivors of B-24 GREEN HORNET that crashed 850 miles from Hawaii. PTO - Alaska: Day 364 of 435 of the Battle of Kiska, Aleutian Islands. US 11th Air Force bombs targets on Kiska Island. PTO - Japan: A full state funeral is given for Isoroku Yamamoto, killed by the US 13th Air Force when shot down over Bougainville on 18 Apr 43. During the ceremony, he is posthumously promoted to the rank of Naval Marshal and given the Order of the Chrysanthemum 1st Class and the German Knight's Cross of the Iron Cross with Oak Leaves and Swords. PTO - New Guinea: Day 45 of 148 of the 2nd Battle of Lae-Salamaua. US 5th and 13th Air Forces provide air support. CBI - Thailand: US 20th Air Force: B-29 Superfortress bombers makes their combat debut when they are sent from India to attack Bangkok, destroying a Japanese military hospital and damaging the Japanese secret police headquarters. The B-29 will go on to become the first aircraft to bomb mainland Japan since Doolittle's raid in 1942 and will drop atomic bombs on Hiroshima and Nagasaki. The B-29 Superfortress is a four-engine propeller-driven heavy bomber, one of the largest aircraft to see service during World War II. A very advanced bomber for this time period, it included features such as a pressurized cabin, an electronic fire-control system, and remote-controlled machine-gun turrets. The name "Superfortress" was derived from that of its well-known predecessor, the B-17 Flying Fortress. 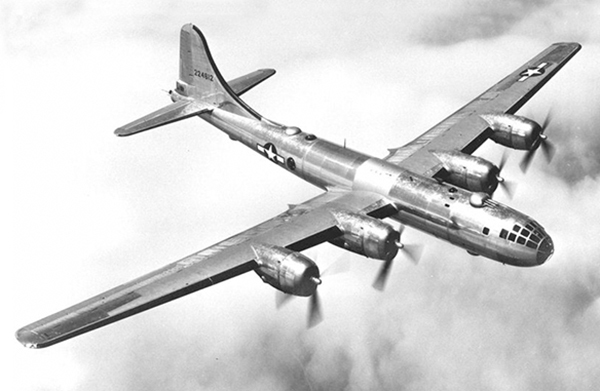 Though the B-29 was designed as a high-altitude daytime bomber, in practice it actually flew more low-altitude nighttime incendiary bombing missions. It was the primary aircraft in the American firebombing campaign against the Empire of Japan in the final months of World War II, and carried out the atomic bombings that destroyed Hiroshima and Nagasaki. ETO - UK: Eisenhower postpones Operation OVERLORD (D-Day) for 24 hours because of rough seas in the English Channel. ETO - France: US 8th and 9th Air Force attack airfields, highway bridges and coastal defense batteries in northern France in preparation for D-Day. ETO - France: With rough conditions in the English Channel and therefore no possibility of an immanent Allied invasion on the French coast, Rommel goes back to Germany for his wife's birthday tomorrow. ETO - France: At 10:15 pm local time, the BBC transmits "wound my heart with a monotonous languor," the second line of the Paul Verlaine poem "Chanson d'automne," to the French Resistance, indicating that the invasion of Europe is set to begin within 48 hours and that they should begin sabotage operations especially on the French railroad system. Russian Front - North: Day 125 of 191 of the Battle of the Narva Isthmus, Estonia. Both German and Soviet troops remain locked in their defensive positions. Russian Front - South: Day 59 of 60 of the Battle of Romania, 1st Jassy Offensive. MTO - Italy: Day 136 of 136 of the Battle of Anzio. The Anzio beachhead and surrounding area is clear of all enemy opposition. MTO - Italy: Day 1 of 16 of the Battle of the Trasimene Line. The Germans will try to hold this line north of Rome but will have to fall back further north to Gothic line. US and British troops begin crossing the Tiber River. CBI - Burma: Day 93 of 166 of the UK's Operation THURSDAY. Monsoon season bogs down all operations. CBI - Burma: Day 88 of 147 of the Battle of Myitkyina. US 10th Air Force provides air support. Monsoon season bogs down all operations. CBI - Burma: Day 66 of 302 of the Chinese Salween Offensive. US 14th Air Force provides air support. Monsoon season bogs down all operations. CBI - China: Day 2,526 of 2,987 of the 2nd Sino-Japanese War. Day 50 of 259 of Japan's Operation ICHI-GO. The USS PUFFER sinks the Japanese tankers ASHIZURI and TAKASAKI in the South China Sea. CBI - India: Day 90 of 118 of the Battle of Imphal-Kohima. PTO - Caroline Islands: US 7th Air Force bombs targets on Nauru Island and Ponape Island. PTO - New Guinea: Day 10 of 83 of the Battle of Biak. 5th Air Force provides air support. PTO - New Guinea: Day 174 of 597 of the Battle of New Britain. US 13th Air Force provides air support. PTO - New Guinea: Day 45 of 481 of the Battle of Western New Guinea. 5th Air Force provides air support. PTO - Solomon Islands: Day 218 of 295 of the Battle of the Bougainville Islands. US 13th Air Force provides air support. South America: Brazil declares war on Japan. Germany: The Allies establish an occupational government in Germany, which divides the country and Berlin into four zones. USSR: Moscow Radio announces the award of the highest Russian honor, the Order of Victory, to Montgomery and Eisenhower. CBI - China: Day 2,891 of 2,987 of the 2nd Sino-Japanese War. Day 66 of 91 of the Battle of Zhijiang. US 14th Air Force provides air support. Japanese troops continue pulling out of China. Day 58 of 60 of the Battle of West Hunan (near Zhijiang). Japanese troops continue withdrawing from southern China. PTO - Dutch East Indies: Day 36 of 52 of the Battle of Tarakan Island. 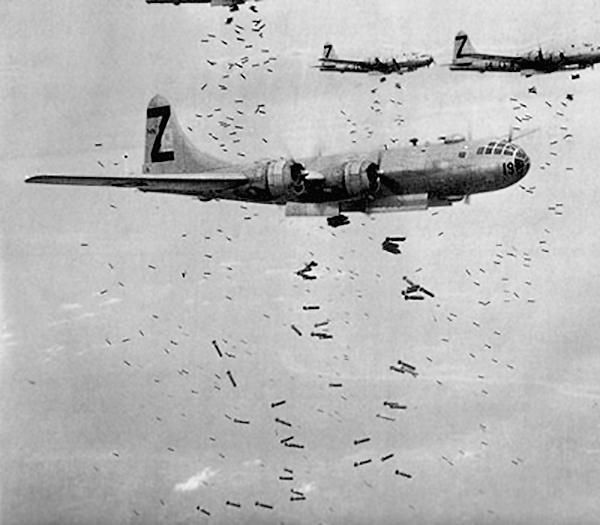 PTO - Japan: US 20th Air Force B-29s fire-bomb the city of Kobe with incendiaries. The attack completely burns up over 4 square miles and damages over half of the city. PTO - Japan: Day 66 of 83 of the Battle of Okinawa. More than 30 American ships are damaged by a typhoon near Okinawa. PTO - New Guinea: Day 526 of 597 of the Battle of New Britain. US 10th Air Force provides air support. PTO - New Guinea: Day 410 of 481 of the Battle of Western New Guinea. US 10th Air Force provides air support. PTO - Philippines: Day 228 of 299 of the 2nd Battle of the Philippines, aka the Liberation of the Philippines or the Philippines Campaign. PTO - Philippines: Day 173 of 244 of the Battle of Luzon. 5th Air Force provides air support. PTO - Philippines: Day 88 of 159 of the Battle of Mindanao Island. 5th Air Force provides air support. PTO - Philippines: Day 80 of 135 of the Battle of the Visayas region. US 5th and 7th Air Forces provide air support. On July 17, 1944, an explosion at Port Chicago killed 320 men, 202 of whom were black ammunition loaders. 328 of the surviving enlistees were sent to load ammunition on another ship and when they refused, 50 were singled out and charged and convicted of mutiny, the largest mutiny trial in U.S. naval history and an early part of the civil rights movement. A piano/vocal/guitar songbook and salute to the music and memories of WWII, including a year-by-year chronology of events on the homefront, dozens of photos, and 51 radio favorites of the GIs and their families back home.